AMD Stone (AMD Mining JSC) is a member of AMD Group with the mission of specializing in mining, processing and supplying stones. AMD Stone are operating natural stone quarries and processing factories in Thanh Hoa, Binh Dinh and Yen Bai provinces. 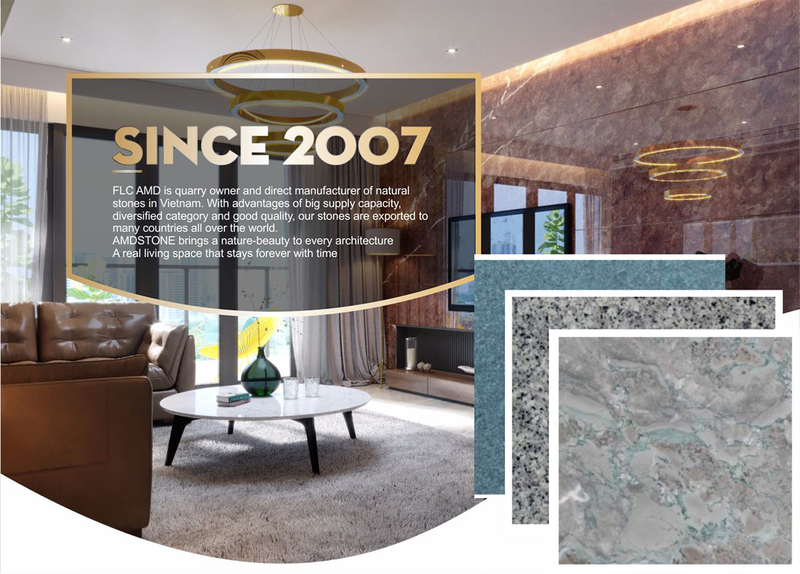 Our products are natural marble mined from quarries in different provinces of Vietnam where the stones are well-known for their beautiful original color, hardness and durability. AMD Mining provides domestic and foreign markets with high quality stone slabs, paving stones, decorative stones, crushed stones and stone blocks for sculpture of art products, monuments. Our products are diverse in types, abundant in size and color which meet international standards on quality with high gloss and durability and are trusted in many construction projects in the country as well as exported to the markets of Europe, Asia, Australia and others. We always have high volume of stocks which ensure timely supply for large-scale works and meet diverse needs of customers for each type of architecture and different tastes. Thank you for your considertation and look forward for our business relation.